MORE THAN A MERE SPIRITUAL EXPERIENCE OR A SET OF POLARIZING BELIEFS! "WHAT WE BELIEVE MUST TRANSCEND OUR SPIRITUALITY TO A PLACE WHERE OUR ACTIONS SPEAK LOUDER THAN OUR WORDS." Crooked Spire Coffee & Art House open 7am-2pm. INFLUENCE gathering with BUILD vibes centred around Communion. A 30 minute gathering followed by an additional 30 minutes of connecting with others designed for followers and believers who want to take it to the next level. We have Live Reflective Music, meditate on some thoughts about what communion means, followed by shared stories about what God has done and is doing in peoples' lives. Then we will partake in communion together. We encourage you to stick around and have some lunch, coffee and time at the table with others in the Crooked Spire. In G Centre's Performing Arts Space, located next to our Crooked Spire Coffee and Art House. BUILD gathering with INFLUENCE vibes. A special time for followers and believers who want to take it to the next level. In G Centre's Performing Arts Space, located next to our Crooked Spire Coffee and Art House and we invite you to bring your coffee and food in with you to take part in our 'Building Believers' course. Periodically on the fifth Sunday of the month. An interactive conversation about Leadership Ideas that will help you live a larger life in every arena of your sphere of influence with World Class Communicator and Leadership Trainer Andrew Schaper. A relaxed one hour private function for people who are interested in building a bigger life and want to go to the next level. A 40 minute presentation followed by 20 minutes of Q&A. 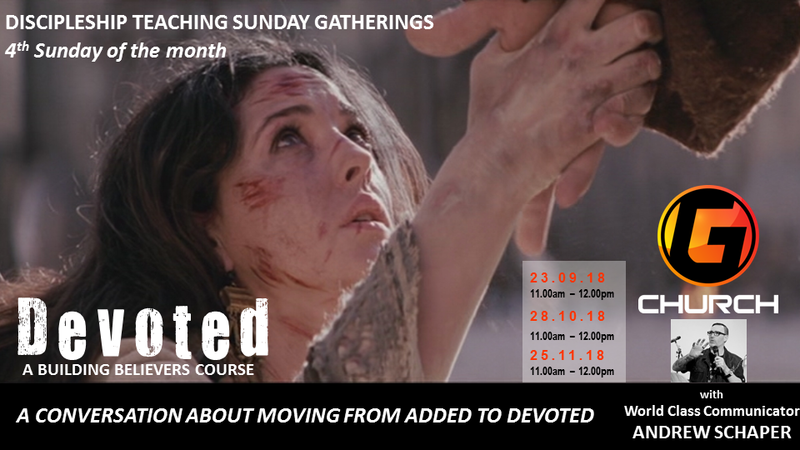 In G Centre's Performing Arts Space, located next to our Crooked Spire Coffee and Art House and we invite you to bring your coffee and food in with you to take part in our Leadership Teaching. Keep an eye out for these special dates! "To create a church that fulfils all facets of the great commission through REACHING, INFLUENCING and BUILDING the GENERATIONS, and focusing their energy toward making a difference in every sphere of life." Matthew 28v19 – 20 outlines The Great Commission which embodies 3 Zones and 6 Core Values. "19 Therefore GO and make disciples of ALL NATIONS..."
From this we get our two REACH values: INTENTIONAL and INCLUSIVE. "Go" is intentional. We value being intentional. We don't go anywhere in life without some intentionality. Here at the G we are intentional in the way we reach people. They may have come to our venue but we intentionally go to them in our approach to the way we structure our GATHERINGS, work in our GROUPS or approach individuals. We also believe it is our responsibility to GO and meet people where they are at. "All nations" is inclusive. We value being inclusive. Here at the G we are inclusive in the way we reach people. We are not here to judge people we exist to love people. We don't say 'Believe, then behave and then we'll allow you to belong.' We say 'Come and belong' because we are inclusive in our approach. Throughout each person's journey of faith they may come to believe, and through their connection to God, or others, their behaviour may change but that's all up to each individual and the choices they make. It won't change the way we approach you. You can belong here. 19 "Therefore go and MAKE DISCIPLES of all nations, BAPTISING them in the name of the Father and of the Son and of the Holy Spirit,"
A disciple is a learner. We value being a learner. Staying teachable is essential for growth and advancement in every sphere of life. Baptising them is about leaving. We value what it means to leave the old behind. Leaving the old and rising to the new signifies the possibilities that become available to us through the rebirthing process that Jesus taught his followers about. This means we can always find a fresh start as a Christ follower. No matter what our background, or the narrative of our former selves, this transformative process allowing us to embrace a new self and new possibilities is available to us. Everyone continues to have some things in their lives that they are not proud of, or defining moments we wish we could break free from. We can change the story of our lives! From this we get out two BUILD values: LOVE and OBEDIENCE. Love and obedience are intrinsic. OBEDIENCE = taught to obey everything. LOVE = Jesus isn't going anywhere. Here at the G we believe that everything in life comes out of the relationships we build. Don't do life alone... we encourage you to do life well with others! OUR LIFE GROUPS ARE FOCUSED AROUND AN "IDEA" OR AN "ACTION"
We are completely funded by the generosity of people and business partners like you. If you have given toward G Justice then email us at info@Gcentre.org with your details so we can keep records and send you a receipt. Thanks for you support, we really appreciate it!